What does “Munrovian” mean? Garth uses it in his preview of Kelly Link’s Get in Trouble. I confess I’ve never heard the term before, but I’m curious to discover its meaning. I’m assuming like Alice Munro-esque. There were a few on The Year in Reading series not mentioned here that I’m looking forward to. In particular Steve Toltz’s Quicksand (September 2014) and Maggie Nelson’s The Argonauts. Thanks for your hard work on this list. Just to note that Modiano’s ‘Suspended Sentences’ is already out (its pub date was moved up to last November in response to the Nobel announcement). Also, Jesse Ball’s new novel will be his fifth, not fourth. Apparently, someone from the Sunday Times wrote yesterday in their cultural highlights for 2015 that Cormac McCarthy will publish two new works this autumn, long and short, that will be linked. I really really want this to be true. Any word on this at all? Seeing such a massive list creates in me a despair that comes from being reminded of the avalanche of good books that come out each year that I’ll never get to read. There is just far too much to read and far too little time. Can’t at the moment think of a short story writer who is LESS like Alice Munro than Kelly Link. Both are fine writers, but similar, no — beyond both being carbon-based life forms. Who write. You forgot the new James Morrow book out in January. Sam: Thanks for those corrections. We’ve updated. Garth, all these comparisons to other authors. I get that you are trying to give us a feel for the style of writing, but do not these authors have their own unique voice? Is everything really so derivative? Is there truly nothing new under the sun? Take a page from Edan, who described your upcoming novel on its own merits. No Murakami meets Matthew Thomas etc. from her. Also re the Ann Packer novel described as Franzen except with likeable characters. How absurd. Shall we describe the new Franzen as like a Packer novel except with characters who are detestable? Thank you, I just had to get that off my chest. In keeping with Tom B’s comments re Kelly Link, same goes for Ann Beattie. She has been writing short stories for about as long as Munro, but that is the only similarity that I can see. Some others below! Like Tom above, I’m also mentioning ‘Galapagos Regained’ by James Morrow. I’m reading it now and it is amazing. Trevor – I’m with you. So overwhelming when so many of these sound like books I would love. I think somehow with the more books I know about, I’m becoming a SLOWER reader, which is terrible! I think comparisons are a fast way to generate interest (if you like x, then you should try y), and sometimes they can be apt. But I agree, I don’t see how Ann Beattie or Kelly Link are anything like Alice Munro. CB- Well slowing down in your reading is perhaps not a bad thing! I also feel like I have to weigh the decision to read newer stuff against the decision to read the classics (much of which, I still haven’t read). Should I pick up that new Murakami novel when I still haven’t read A Tale of Two Cities? Further, I never know how the Millions staff and much of its readership knows about this many contemporary authors. I suppose I do know of a litany of current writers as well, but many of these writers referenced above I have never heard of. Jay, thanks for your comment and the wink across cyber-space. You made me laugh. Yes, trying to mix the classics with the new books is tough! So many new books AND so many classics I haven’t read yet! Trevor – I know about most of those books through authoralerts.com. They have a max of 200 authors you can follow, so I try to follow 200 authors I’m interested in at a time. But I’m also always amazed at how many books are included on the ‘Anticipated’ lists. I want to say Hilary Mantel’s Tudor Trilogy is ending this year as well? That’s another book I can’t wait for! Please add A Little Life by Hanya Yanagihara! If there’s a better bookthan this coming out in 2015, I’ll be shocked. The translation of Orhan Pamuk’s latest novel “A Strangeness in My Mind”, which is scheduled for publication in October, should be added to this list. What about Larry Kramer’s new novel? Coming out in May. Anthony Marra has a new short story collection due out in the fall, as well. When will you be releasing part two? 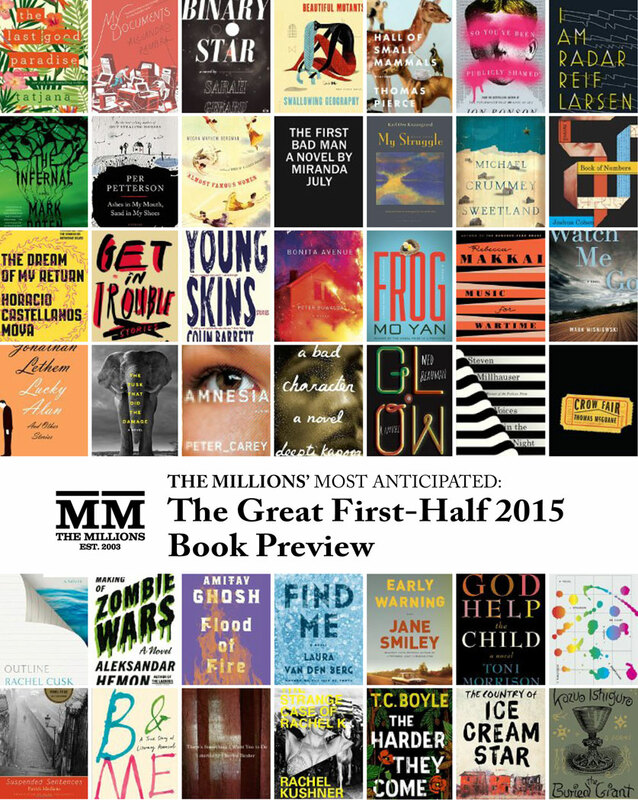 Already many books (with potential) are hitting shelves…and yet remain unannounced by “The Millions”. Kate Walbert’s “The Sunken Cathedral”, for example. William Vollman’s latest tome, for another.